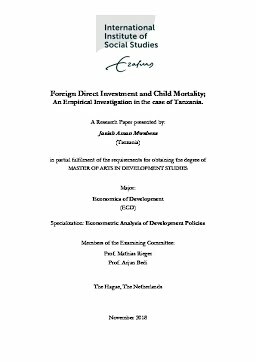 This paper examines the impact of Foreign Direct Investment (FDI) on child mortality in Tanzania mainland during 1999-2012 period. FDI impact on child mortality is hypothesized to be mediated through incomes, the paper thus first examines FDI effect on income and then consequent income impact on child mortality. Focusing on 17 Tanzania mainland regions, the paper uses panel data gathered from multiple sources such as Population and Hosing Census, National Accounts and Foreign Private Investment Reports. Fixed-Effect regressions technique is employed for main analysis. Study finds FDI to exert positive effect on income however income is found to have no consequent impact on child mortality, thus concluding FDI to have no significant effect on child mortality in Tanzania. Absence of effect is thought to be due to weak direct association between income and child mortality that was also observed in previous case study. Study was limited by absence of well-established analytical frameworks for FDI and child mortality relationship, it therefore argues for more studies to be conducted on the subject as globalization accelerates at unprecedented pace.